On March 7, 2019, Top 10 Cases Promoting Progress of Rule of Law in 2018 was released. It was coorganized by the Information Bureau of Supreme People's Court and China Central Television (CCTV ) Press Center. Dior's 3D Trademark Case represented by NTD was selected as the only intellectual property case. The other listed cases are: Zhang Wenzhong's Acquittal Case; Sudden Death Caused by Discouraging Smoking in Elevator in Zhengzhou; Sun Zhengcai's Bribe-taking Case; General Ye Ting Offspring's accusation against Xi’an MoMo in a reputation infringement; Xu Shuiyun's accusation against Wu Cheng District Government for Illegal Demolition; A Hit-and-Run Death Caused by Zhu Zhenbiao's Chasing; Jiangsu Provincial Government accusation against Haide Company for Damaging Ecological Environment; Liu Yongtian's Gang-related criminal case; Ping’an Lutong ordered by Beijing's Shunyi District Court to pay compensation for Pipi's cripple. The selection has been held for the fourth time since 2015. This year many netizens voted for 20 nominated cases, mainly through the media platforms covering the official Weibo, Wechat of the Supreme People's Court, the website of China Court, the official Wechat of China Trial Magazine, etc., and more than 40, 000, 000 valid votes were received. An expert jury was formed to evaluate the cases. 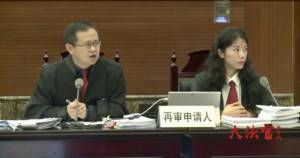 They are law experts from Peking University, Tsinghua University, senior news experts from the People's Daily, the Xinhua News Agency, China Media Group, and the department heads from the Supreme People's Court. Ultimately, top 10 cases were selected based on the votes and experts opinions.